Don’t let summer fun damage your wood floors! Everyone loves the summer time! Kids are out of school, so families can finally take those long-awaited vacations and the temperatures are warm enough to go for a swim. Summer is the season of backyard barbecues and family cookouts. So, how do you keep your wood floors safe from all of that increased traffic? 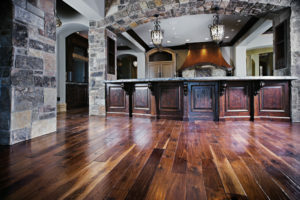 Your wood floors are exceedingly easy to clean and care for. A simple dry dust mop is plenty for everyday tidying. Maintenance is key. You can use a vacuum for larger particulates, but that shouldn’t be necessary for everyday use. Whenever necessary, a damp mop can be used to clean up those once-in-a-while messes. An unfortunate side effect of summer on the East Coast is that along with the warmer temperatures, we also get lots and lots of humidity. When you’re hot, usually putting on a fan or cranking the air conditioning works well enough to cool you off. Your wood floors aren’t sensitive to heat like you are, but they are susceptible to damage from too much humidity in the air. If you live in an area that gets particularly humid this time of year, consider purchasing a dehumidifier. It will dry out the air and keep your flooring from being damaged. Whenever it’s time to replace your wood floors, you should also talk to your installer about putting in an underlayment underneath the new floor as well. More foot traffic on your wood floors means more chances for scratching and gouging. Dirt and sand from messy shoes, dog feet and claws, and all manner of other things that traipse around your home in the summer can hurt your gorgeous floors. To combat this, we highly recommend instituting a “no shoes” policy. Throw rugs will help in high-traffic areas. Don’t let summer fun damage your wood floors!